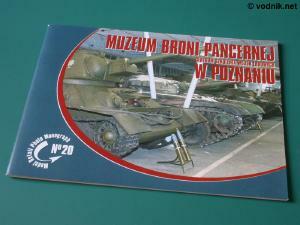 Reviewed book is a 20th issue in a Model Detail Photo Monograph series from Polish Rossagraph company. The title of this book translated into English could be "Armored Warfare Museum of Polish Army Training Center in Poznan". The book is only available in Polish and is rather unusual item in the MDPM series, as it is actually not a monograph. It is basically a guide to the museum and according to first paragraph in a book it is addressed mainly to students of Army Training Center, who also work as museum docents. The soft cover book is printed on high quality paper. This book is in a size common to all publications in MDPM series: 155 mm x 215 mm and contains 32 pages. - armored reconnaissance car "FUG"
- medium tank T-34-85MT "Rudy"
- wheeled armored carrier BTR-60-PB. The order in which vehicles are listed in the book represents the order in which they stand in museum halls and exhibition areas. At the end of the book we find a part of street map of Poznan with location of the museum shown. Also included on this page is short information that the museum is available to visitors only after telephone arrangement and this is the only text in the whole book, which is provided in both Polish and English languages. The phone number is of course given. At the beginning of the book we get the history of museum, development of Polish armor and operations of Polish armored units during World War 2. Book is presented in catalogue style: single photo, short text and basic specifications. At the end of the book we get a plan of Poznan with the location of museum shown.